Use a muffin mix to whip up these anytime holiday treats in a snap. Preheat oven to 375°. Coat a baking sheet with cooking spray. In a medium bowl, combine muffin mix, flour, cinnamon, ginger and nutmeg. Cut cold butter into cubes and blend into flour using a fork or pastry cutter until butter resembles small peas. Add dried cherries and orange zest, stir to combine. Add half and half, stir until dough begins to come together (dough will seem dry). Turn the dough onto a flat surface lightly dusted with cocoa powder and knead dough for 1-2 minutes. Shape dough into an 8-inch circle. Cut into 8 wedges and place 2 inches apart on baking sheet. Bake for 20 minutes until firm in the center. Cool on a wire rack. While scones bake, prepare the glaze: In a small bowl, combine all glaze ingredients and whisk together until smooth. Drizzle glaze onto cooled scones. 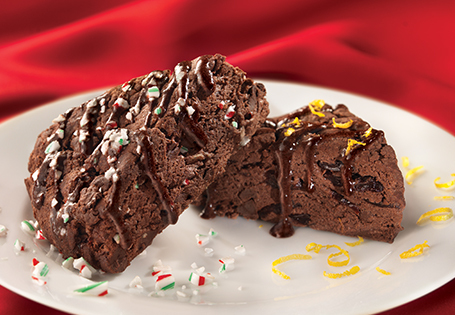 Chocolate-Peppermint-Crunch Variation: Substitute ½ cup crushed candy canes for the spices, orange zest and dried cherries. For glaze, omit orange zest. After topping scones with glaze, sprinkle scones with 3 tablespoons crushed candy canes.